Why are we still obsessed with rose gold? It’s pretty, it’s warm, it stands out and it photographs well (shoutout to the jewelry influencers). Not to mention, rose gold goes well with just about anything. We love when our brides choose to customize a Coast Diamond ring in rose gold. Our friends at Lamon Jewelers do too. Their passion is to help you highlight the most important moments in your life with a piece of jewelry. That’s why they encourage you to customize your choice to make it even more perfect for that special moment. We are thrilled to, once again, feature Lamon Jewelers Tennessee as our Coast Diamond Retailer of the Week. Rose gold… Ringspo calls it “a modern and stylish choice.” From iPhones to bridesmaids dresses, hair color to kitchen accessories, everyone is obsessed with rose gold. It doesn’t get any more breathtaking than this… Our classic Coast Diamond cushion-shaped halo engagement ring (LC5391) customized in a two-tone rose and white gold setting. A one carat round diamond center stone is surrounded by a halo of fine pavé set diamonds set in white gold. The tailored shank also has fine pavé set diamonds but set in rose gold. The entire ring is framed in milgrain beads. Gorgeous! The perfect stack of rings has a rose gold band in it. Set in rose gold and finished with milgrain edging, our Coast Diamond band (WC7034RG), featuring round diamonds set within marquise shapes, adds color and texture to your stack. Your fine jewelry is personal and celebrates life and love. It becomes a part of you when you customize it. All of our Coast Diamond designs are available in (14K or 18K) White, Yellow and Rose Gold, or Platinum. You can see the distinct difference in our Coast Diamond band (WC5181H) set with 0.49 ctw of diamonds. Which is your favorite? Congratulations Lamon Jewelers Tennessee! You’re our Coast Diamond Retailer of the Week! Don’t forget to #ShowYourCoast with your beautiful rose gold Coast Diamond. 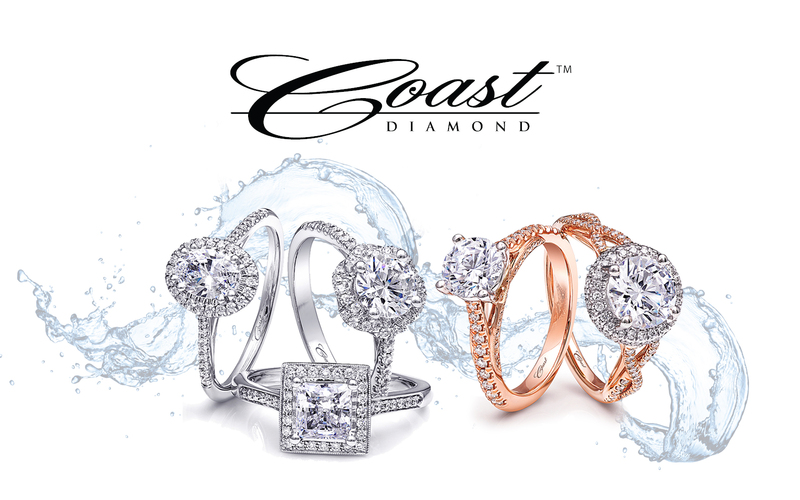 For a Coast Diamond Authorized Dealer near you click here. There is nothing like the wedding traditions of the South. The engagement is the start of an exciting time of planning and anticipating these traditions playing out on your wedding day. Your first stop is Elgin’s Fine Jewelry in Baton Rouge, LA because it is their number one priority to provide you with a wonderful and memorable experience as you shop for your elegant Coast Diamond engagement ring. It doesn’t hurt that their second priority is value. For over 30 years, southern brides have chosen the most elegant Coast Diamond designs with the guidance and impeccable customer service of our Retailer of the Week, Elgin’s Fine Jewelry in Baton Rouge, LA. What is your favorite southern wedding tradition? Since it is our passion, we are partial to the elegant Coast Diamond rings adored by Southern brides, chosen at Elgin’s Fine Jewelry. The cushion-shaped halo engagement ring is the ultimate in elegant engagement ring design. Our Coast Diamond cushion shaped halo engagement ring (LC5340) is made modern with a split shank of diamonds. Customize it! An Elgin’s jeweler can help you choose your favorite center stone shape and metal to make it more personal to you. The Coast Diamond oval halo engagement ring (LC10233) is the right way to mix your elegant style with your flair for creativity. The organic shape of this oval halo is surrounded by delicately set diamonds that continue down the sides of the ring. A wedding band is the symbol of endless love. Whether presented to her on your wedding day or for an anniversary, Coast’s diamond band (WZ5001H) set with 0.75 ctw round diamonds is stunning and timeless. Which elegant Coast Diamond ring do you choose? We can’t wait for you to #ShowYourCoast after you visit Elgin’s Fine Jewelry in Baton Rouge. Congratulations, Elgin’s Fine Jewelry of Baton Rouge, LA for being our Coast Diamond Retailer of the Week! Find a Coast Authorized Dealer near you. Attention Fairfax, VA residents! Check out Quest Fine Jewelers – Bridal Showcase Weekend featuring Coast! More info HERE. Attention Georgia residents! Check out D. Geller’s “Diamond & Designer Bridal Event” featuring Coast Diamond. More info HERE. One lucky customer will win $2,000 towards their honeymoon! More info HERE.